ASSISTS WITH INTESTINAL HEALTH AND IMMUNE FUNCTION – Advanced blend of 5 bacterial strains (2 billion CFU’s per tablet) in a Prebiotic Inulin Base and mix of enzymes, to support your dog’s digestive and immune system, by producing and maintaining a healthy level of beneficial bacteria in the intestine. EFFECTIVE MULTI FUNCTIONAL PRODUCT – As well as a Probiotic the supplement also contains a Prebiotic, which acts as a food source for the beneficial bacteria upon reaching the intestine, and digestive enzymes which optimise the breakdown of carbohydrates, proteins, fat and cellulose. MANAGES A RANGE OF CONDITIONS – Helps combat diarrhea, leaky gut, colitis, irritable bowel syndrome, inflammatory bowel disease, yeast infections, food allergies, flatulence, and as well as boosting the immune system assists in reseeding the intestines with beneficial bacteria after taking antibiotics or steroids. QUALITY GUARANTEED – Made in the UK, using natural human grade ingredients, to GMP code of practice and ISO 9001 certification which guarantees a consistent high quality product. CONVENIENCE IN MIND – The tablets are packaged in a special letterbox friendly container, which means your package will always be delivered securely and not left outdoors or undelivered. As the supplement is in tablet form there is no measuring or mess associated with liquids and powders. 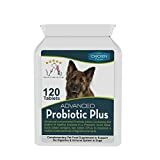 Our Advanced Probiotic Plus supplement is a triple action natural food supplement designed to boost the canine immune system and promote a healthy digestive tract. When your dog is approaching old age, is taking medications such as antibiotics or steroids, or is on a modern processed diet, the number of beneficial bacteria in the intestine can be seriously depleted. This makes it difficult for the body to absorb the vital nutrients required and stop the spread of harmful bacteria. This supplement is designed to address these issues supporting the digestive and immune systems with an all in one formulation. As well as flooding the gut with beneficial microorganisms, the key to preventing harmful bacteria becoming established, the supplement contains a prebiotic which feeds the healthy live bacteria, inducing rapid growth and activity. The product also incorporates a full spectrum of digestive enzymes which break down food types which are more difficult to digest, maximising the intake of nutrients. * Contains 5 strains of bacteria, Lactobacillus acidophilus, Lactobacillus plantarum, Lactobacillus brevis, Lactobacillus rhamnosus, Bifidobacterium animalis lactis, with 2 billion CFU microorganisms per tablet. * In tablet form the bacteria remain dormant until they reach the moist conditions of the intestine, where they are then reactivated. This protects the bacteria against the harsh conditions of the stomach maximising viability. * Incorporates a natural food source for the bacteria, so upon reaching the intestine they are able to utilise this in order to multiply and spread rapidly. * Features a blend of digestive enzymes, including amylase, protease, lipase, cellulase, lactase and bromelain which helps in the breakdown of carbohydrates, proteins, fats, fibre and lactose. Additional non-active ingredients include microcrystalline cellulose, di calcium phosphate, chicken flavouring & magnesium stearate. PRO BIOTIC BLEND FOR DOGS - 120 Chicken Flavoured Tablets - The Best Digestive Immunity Health Supplement for K9 Canine - Helps with Diarrhoea, Leaky Gut, Colitis, IBS & more - Healthy Pets - 5 Strain, 2 Billion CFU's Probiotics with added Digestive Enzymes and Inulin Prebiotics. UK MANUFACTURER. 100% Satisfaction. This entry was posted in Stress and Anxiety Help and tagged Advanced, Bacteria, Base, Billion, Boosts, Canine, CFU's, Digestive, Enzymes, Health, Immunity, Inulin, Manufactured, Plus+, Prebiotic, Probiotic, Strains, Tablet, Tablets by TMSSS. Bookmark the permalink.